Do you find yourself in a life transition where apartment life is on the horizon? I dreaded the thought of moving into an apartment after my divorce. Superficially and selfishly I listed all of the reasons why I deserved better. 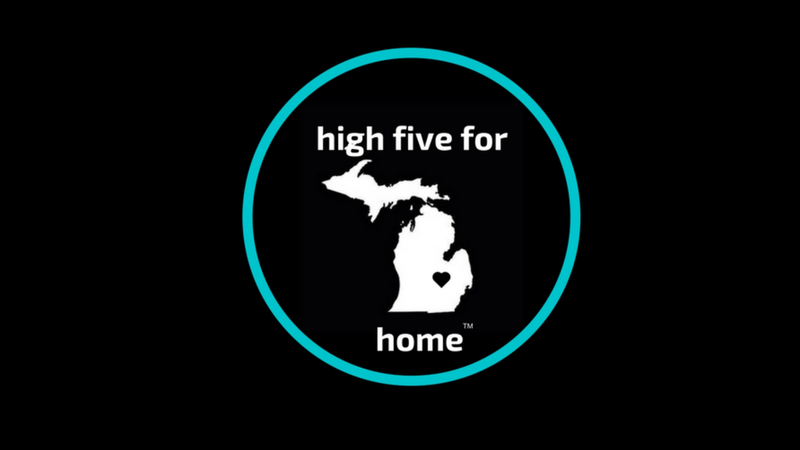 In my area of Michigan, apartments aren’t the luxury living you see in the movies. But since being totally settled into my apartment, I am finding the blessings and joy of downsized living and 5 great reasons why living in an apartment is the key to happiness. Flashback to marriage…The continual conversation the former spouse and I had for years when we spoke about budgeting was should we sell the house and rent a condo. We always came back to the same conclusion-the amount we were spending to own our home was the same, if not less, than renting. So we stayed put in our home until our decision to end our marriage forced us to sell. One of the biggest points of sadness I had after getting a divorce was where I would live and what type of home I would be able to provide for myself and Sweet V on one income…a charter school teacher income at that. The conversation FS and I had constantly rang in my head and I was so frustrated. Plus the idea of apartment life after so many years of living in houses just seemed awful to me. I felt like I had lost the American dream and all I had worked so hard for. Finished basement. Yard. Neighborhood bike rides. Privacy. But since selling my house this year, subletting a one bedroom, and now finally settled into my own two-bedroom space, I can honestly say that apartment life is a relief and not at all like the college years I thought I was going to relive. It has been the key to happiness. 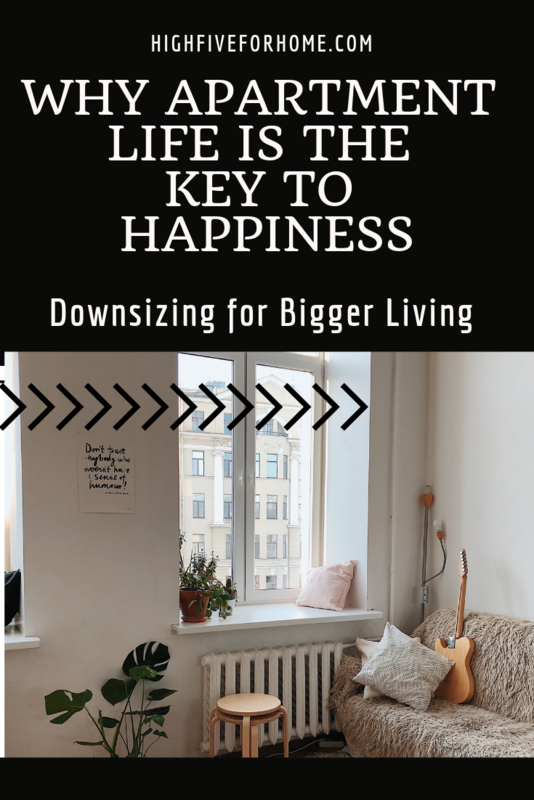 So if you find yourself in transition, here are a few reasons why downsizing brings about bigger living. One of the old arts of neighboring has been lost in large subdivisions. We lived for years in a sub and barely got to know our neighbors. Mostly by our two parent working life of crazy we lived. We could come and go and never have to do more than a wave and a smile. And I thought I liked that privacy and solitude. But it isn’t very Jesus like. Love your neighbor as yourself doesn’t really fit if you don’t know your neighbors’ names. I am not having parties with my new neighbors quite yet, but I am conversing and getting to know them little by little. Human connection is so important. We were not created to be alone. Last week, I walked into my apartment to water pouring out of the entryway light fixture and soaking wet stairs. The same thing was happening in the unit next door. Apparently the pipe between the walls of the laundry rooms burst in the frigid Michigan temps. Within minutes, a maintenance person was in both of our homes, assessing the situation, and cleaning up water. A crew was there the next day fixing the pipe in the wall and all will be back to normal soon. I couldn’t help to think about the stress that would have been added to my life had this happened in my own home. Water clean-up. Electrical. Plumbing. Drywall. Time off of work to find people to do these things or learning to do them myself. Not to mention the price tag for all of that! I may be paying a premium for 1000 square feet, but the peace of mind that I have help at a moments’ notice should something go wrong is worth it for this busy working momma. In my previous 2400+sq ft. home, I struggled to make it feel homey and cozy. There were so many nooks to fill and a ton of wall space to cover. I didn’t want to keep spending money on décor and accumulating more stuff, but I also didn’t like the empty feeling when home is supposed to feel full of life. I found myself impulse buying more and more themed party items, blankets, kitchen gadgets, and shoes because I had plenty of closet space and an entire storage room for seasonal bins. It was neatly tucked away for whenever I decided to use it. And it was heavy. Preparing to list the house, purge the closets, bins, and that storage room was no easy feat. In the words of Marie Kondo, there wasn’t a whole lot that brought me enough joy to keep. But I didn’t want to get rid of any of it either. I had already spent money on this and what if I needed it again? 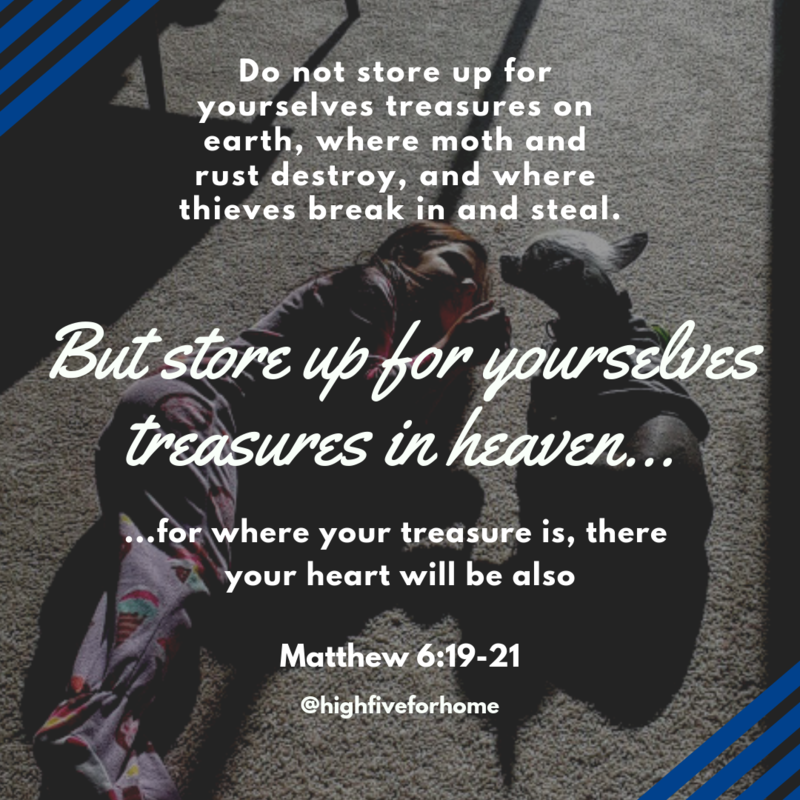 So after the house sold I coughed up even more money for a storage unit and after an added $79 a month for half of the year, I realized that I was living quite fine without the majority of what had been hidden away in my home. I purged that unit down to what could fit in my new apartment and the small garage space. The work it took to scale down my life has made me question every.single.item I place in my cart at Target or on Amazon. I ask myself if I really, truly need this to function and do I have a space for this throughout the seasons. If I cannot answer yes, then I do not purchase it. To piggy back on the forced minimalism, the simplicity of my kitchen surprisingly gives me a sense of peace. My kitchen is tiny so I have only the utensils I need and I have learned a rhythm and routine of food prep that is more strategic for quick clean up. 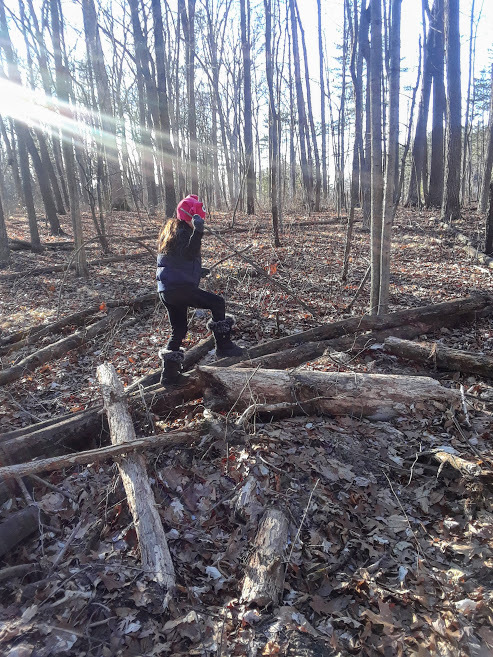 Without the added counter space to leave school work piles, toys from the car, dirty dishes for the morning, or all of the items in a recipe at once, I work smarter and more efficiently. I clean up as I go when cooking. Everything gets put away, right away when we transition from car to home. I shine my sink every night and run and empty the dishwasher often. I don’t feel like meal prep and clean-up is the focus of my day like I did when I had a sprawling kitchen. Seriously…aren’t we all looking for this? Apartment living gives you this. I can clean, like really clean my entire living space in an hour. Vacuuming. Two bathrooms. Kitchen +floor. Dust. Bedroom. All ready and presentable for company (maybe my new neighbors?) in one hour a week (plus a few more runs of the vacuum). And because my hoarding habits can’t survive and more efficient kitchen usage has been put into play, the place stays pretty decent throughout the week. I am even teaching my daughter how less is more. I don’t feel like a prisoner to my home and I can get out and enjoy the world around me. When I began this post, I was watching my Sweet V enjoy open gym time where she trains. She was having an amazing snow day and I was doing what I love…write. 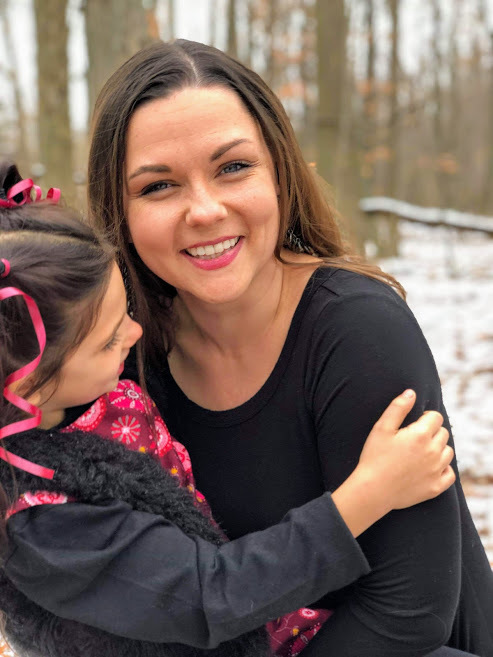 Snow days of the past allowed me to come up for air to catch up on domestic #momlife, but now that apartment living has made life so simple, snow days are meant for enjoying this beautiful gift of life. Today is another snow day and I’ll be baking muffins later. Lower energy bills. Community pool. Car wash area. Fitness center. Dog park area. Community located near the major business area and freeways. No matter what type of dwelling you are residing in, keep making your house a love filled home. Yes! The bigger my house, the more junk I acquire. Downsizing and getting rid of all my stuff would feel so good! I love apartment life! This summer, my husband and I upgraded from our 670 sq. ft. one-bedroom apartment to a 873 sq. ft. apartment. We had so much extra storage space we didn’t know what to do with—so we purged more stuff! I do have several kitchen cabinets empty, but I’m happy! We’ve been purchasing some entertaining serveware, but other than that, we pretty much keep what we use regularly or seasonal decorations. I can’t believe how much stress extra stuff is! Extra stuff takes up emotional real estate in addition to space in our homes. It’s so nice to get rid of what we don’t use/need. Thanks for stopping by! Yes! Having an apartment of my own is great! Since I live on my own, I don’t have to clean as much I should. But I bet it’s also nice having a nice, even though there’s a lot of upkeep. However, I think I’ll keep my apartment for a little.